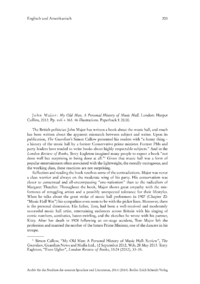 The British politician John Major has written a book about the music hall, and much has been written about the apparent mismatch between subject and writer. Upon its publication, The Guardians Simon Callow presented his readers with a funny thing  a history of the music hall by a former Conservative prime minister. Former PMs and party leaders have tended to write books about highly respectable subjects. And in the London Review of Books, Terry Eagleton imagined many people to expect a book not done well but surprising in being done at all. Given that music hall was a form of popular entertainment often associated with the lightweight, the morally outrageous, and the working class, these reactions are not surprising.